Update at 7:30 a.m. Sunday, March 24: Three wolves were saved from Michipicoten Island on Saturday. There were two females and one male. The scars on the breeding female’s face document a hard-fought life. She is in poor body condition and is probably at the end of her reproductive life cycle. However, she will be able to join her mate on Isle Royale where abundant prey is available and define how many chapters will remain for her life. Her daughter is a 2-year-old female, number 15. She had a colon full of small plastic bits and was far away from bait piles where the males were captured. With weight differences it would have been hard to hold her own at a bait pile with males tipping the scales at more than 90 pounds. The females were weighed between 50 and 60 pounds. She appeared to be in the early stages of pregnancy. Parks staff will monitor her progress and success. Food has been scarce for the last year and there is no evidence that 2018 pups survived. These pups will have a better chance and the female has the opportunity to breed again. Most of the beaver huts had multiple wolf tracks all over top of them as the wolves waited for the first signs of spring break up. One of the captured Michipicoten males had recently caught a beaver. Any remaining wolves on Michipicoten will have slim pickings as spring evolves into summer. The research project will continue on the remaining. There may be one or two wolves remaining on Michipicoten, but none could be located and the operation shifted to the mainland to see if an additional wolf could be added to the black pack as the donor funds were running down. Within an hour, a healthy 99-pound male was caught from the original pack. With the remaining funding, OMNRF had just enough funding to complete the transfers of all the wolves caught on Friday and Saturday to Isle Royale National Park with the operation coming to a close at sunset. Update as of Saturday, March 23, 7 p.m.: Two females (the breeding female and a second, which is possibly her daughter) were captured on Michipicoten Island. Later Saturday, the crew found a 100-pound black male wolf on the island. All three are going to be released on Isle Royale either tonight or Sunday, March 24. We should have photos soon. 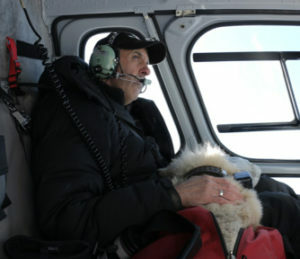 Update as of Saturday, March 23, 7 a.m: On Thursday, March 21, the professional capture team from Bighorn Helicopter indicated they were available for the Michipicoten wolf capture effort if Ontario Ministry of Natural Resources and Forestry and the National Park Service could start early on Friday, March 22. SUNY Professor Jerry Belant lending a hand to Ashley McCleran to conduct a field check of female wolf. Photo courtesy of National Parks of Lake Superior Foundation, J. Graham. 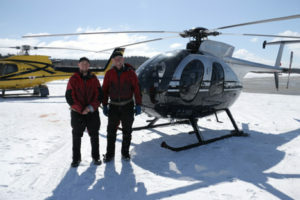 Bighorn Helicopter owner (R) Clay Wilson and net gunner Clayton Thibeault ready to begin operations. Photo courtesy of National Parks of Lake Superior Foundation, J. Graham. Michipicoten Park Superintendent Bob Elliott holding an anesthetized wolf for transport to vet check stations. Photo courtesy of National Parks of Lake Superior Foundation, J. Graham. National Park Service Veterinarian Michelle Verant and Thunder Bay Veterinarian Nicole Chandler thoroughly examine wolf 009 from Michipicoten. Photo courtesy of National Parks of Lake Superior Foundation, J. Graham. 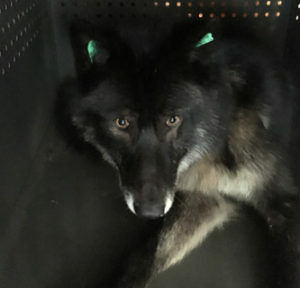 The team mobilized early and by the end of Friday, four Michipicoten wolves were caught on the island and transported for veterinary checks in the Wawa area. Three males and one female were captured, with one male weighing in at 99 pounds. The wolves ranged from poor to good condition, and all were deemed suitable for transport to Isle Royale National Park. The wolves are being held overnight due to darkness and air transport availability. A number of critical factors fell into place for the team Friday. The first was that the professional contract crew, the pilots, could actually see Michipicoten Island from the mainland when they headed out and had smooth flying weather. Second, the remaining wolves had banded into small packs making capture less disruptive to non-targeted wolves. The alpha female was sighted and appeared to be in good health, running with two other wolves. 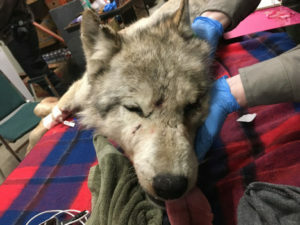 The capture crews are returning to the island Saturday morning to target her capture while the four wolves captured on Friday will make the journey across Lake Superior Saturday to arrive on Isle Royale National Park in the late afternoon. All photos are courtesy of the National Parks of Lake Superior Foundation, J. Graham. To see where Michipicoten Island is, click here. When images and more details from today’s efforts become available, we will post them here. Friday, March 22, 2 p.m.: the International Wolf Center learned that two of the remaining wolves on Michipicoten Island were captured. The wolves are en route to a facility where their health will be assessed. If they are deemed healthy, they will be flown to Isle Royale where they will be released as quickly and carefully as possible. 9 a.m. Friday, March 22. 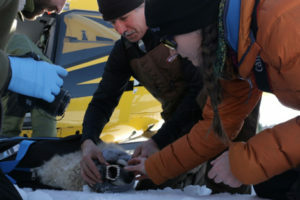 The International Wolf Center will be posting daily updates this weekend on the progress of an urgent operation to move about six wolves to Isle Royale. Those updates will be posted on this page. Work is expected to begin today and we should have an update early this evening. Of course, all of this depends on numerous factors out of our control. We do promise to do our best to get the updates posted on a timely basis.